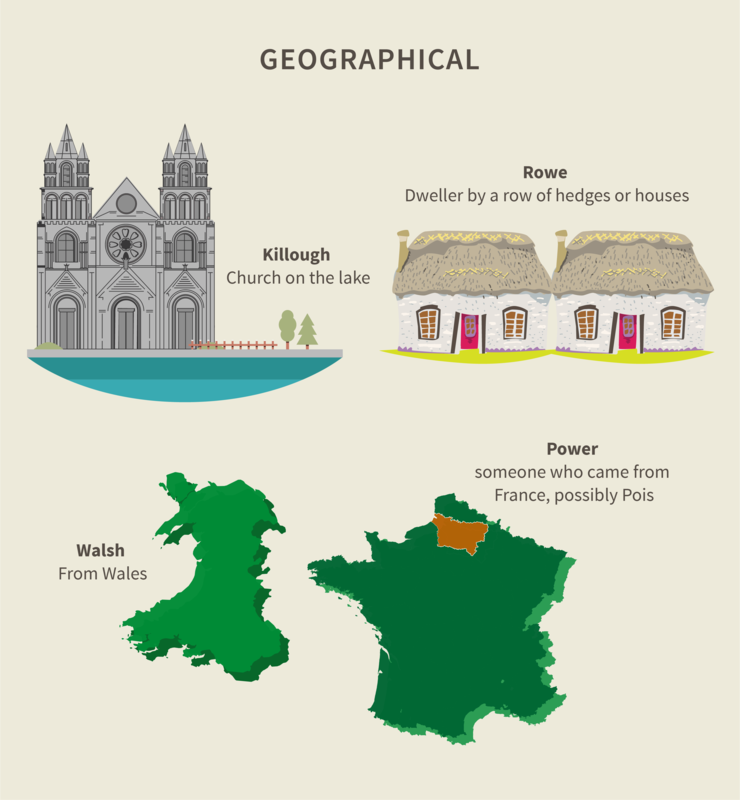 Map of the Week: What’s in an Irish Surname? 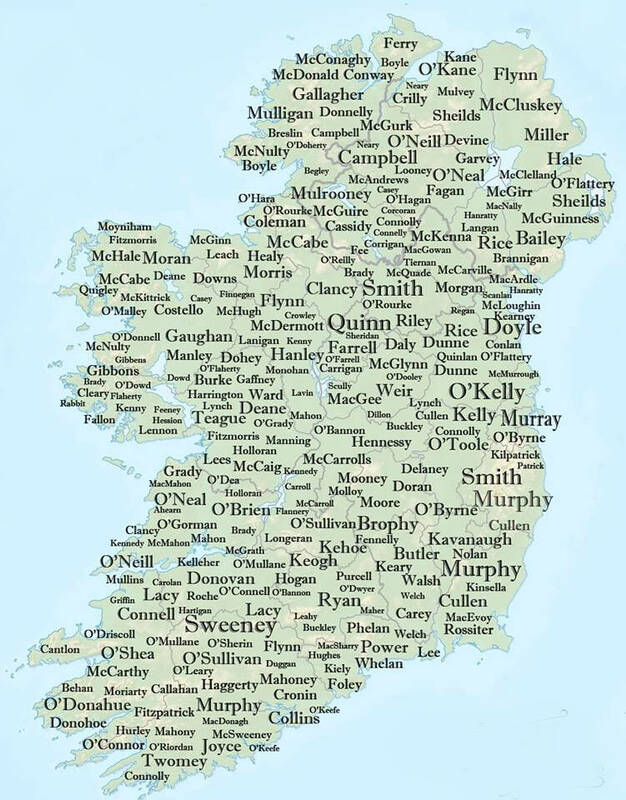 In celebration of St. Patrick’s Day on March 17th, this week’s map is interactive and explores Irish surnames and their geographic distribution; it was created by Kent Field using Irish Census data from 1890. In the United States, a family name is typically a part of a someone’s full name. According to law or custom family names are passed or given to children from one or both of their parents’ family names. The use of family names is common in most cultures around the world, with each culture having its own set of rules for how these names are formed, passed and used. Whether it is the most common name or a slightly more obscure name, Irish surnames can tell a lot about a person’s lineage or family. Patronymic surnames are based on someone’s father’s names and are passed on from generations to generations. “Ó” means descendant, also interpreted as “grandson of” whereas “Mac” means “son of.” The most common surnames are Murphy, Kelly, Ó’Sullivan, Walsh, and Smith. The earliest known Irish surname, O Cleirigh is an example of an occupational surname and is given to someone descended from a clerk. Descriptive names, on the other hand, were names that described the first person to take them; therefore a person with the surname Cassidy most likely has curly-hair. Geographical, or toponymic, surnames are derived from the location of where the original name bearer once lived; these are rarer. Cartographer Jakub Marian, created a map of the most common surname in for the European countries. 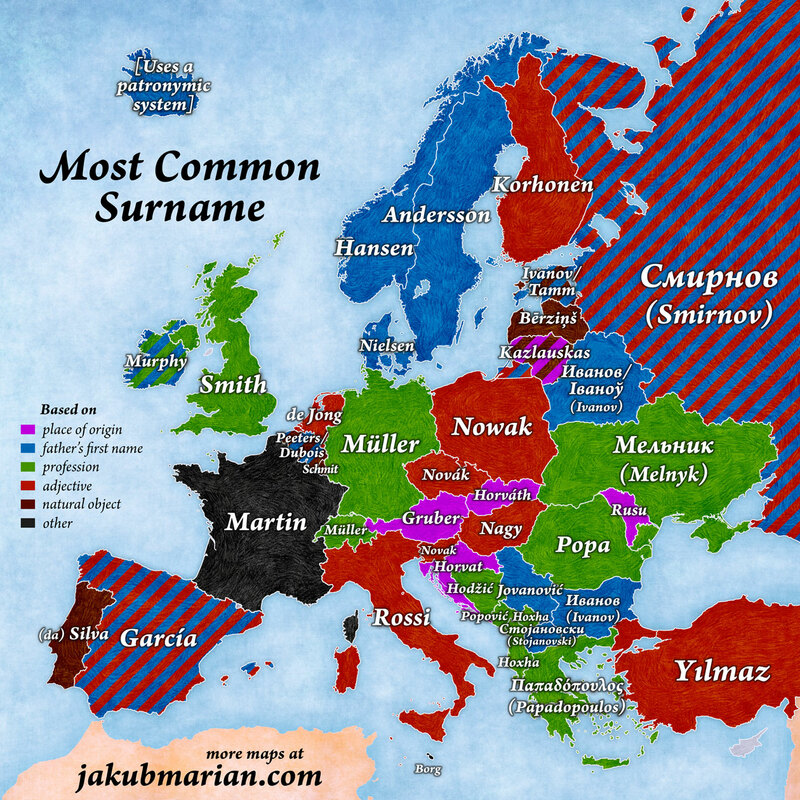 Click on the map to learn more about the meaning of other popular European surnames. Gruber is a German surname from Bavaria, referring to a person from a geological depression, mine, or pit. Iceland uses a patronymic system, where the son of Jón Einarsson will have the surname Jónsson and the daughter will have the surname Jónsdóttir. Silva is a surname in Portuguese-speaking countries and its meaning is derived from the Latin word silva meaning ‘forest’ or ‘woodland’. The reason why Martin became a popular surname in France is unclear, but the origins of its frequency can be attributed to Saint Martin of Tours, who was the most popular French saint.